When should I replace my hard hat? Users of industrial head protection devices must realize that these products do not have an indefinite useful life. Bullard recommends that a regular head protection replacement program be conducted by employers as a responsive solution to the task of addressing service life of hard hats/caps. Since the details of such a program must be developed based on work conditions at each job site, it is impossible to provide a specific time frame for cap replacement. As a general guideline, many large corporations replace all employees’ caps every five years, regardless of the cap’s outward appearance. On average, the suspension should be replaced every 12 months. Where user environments are known to include higher exposure to temperature extremes, sunlight or chemicals, hard hats/caps should be replaced automatically after two years of use. This is based on information and cap samples returned to Bullard after exposure to such conditions. In certain rare instances, a cap may need to be replaced within less than two years. Compress the shell inward from the sides about 1” (2.5 cm) with both hands and then release the pressure without dropping the shell. The shell should quickly return to its original shape, exhibiting elasticity. Compare the elasticity of the sample with that of a new shell. If the sample does not exhibit elasticity similar to that of a new shell, or if it cracks due to brittleness, it should be replaced immediately. Can I wear my hard hat backwards? Bullard ANSI/ISEA Z89.1 Type 1 hard hats have been tested and found to be compliant to the requirements of the standard when worn with the shell turned backwards. To perform properly in this manner, the suspension must be reversed in the helmet, so that the headband is oriented normally to the wearer’s head (i.e., with the brow pad against the forehead and the extended nape strap at the base of the skull). In this manner, only the shell of the helmet is backwards on the head. This applies to ANSI/ISEA Z89.1 Type 1 helmets only (Bullard models C30, 3000, C33, 303, 302RT, 4100, 502, S51, S61, S62, S71, 911C & 911H). ANSI/ISEA Z89.1 Type 2 helmets (Advent® and Vector), because of the lower rear edge of the shell and the asymmetrical pattern of protection offered by their more complex design, should not be worn backwards. Can I wear a baseball cap under my hard hat? Bullard hard hats/caps meet or exceed ANSI/ISEA Z89.1 standards for industrial worker protective headwear. Currently, there are no requirements or tests to examine the effect that a cap or any other object worn inside a hard hat may have on hard hat performance. Therefore, Bullard recommends that hard hat users should never carry or wear anything inside a hard hat. A clearance must be maintained between the hard hat shell and the wearer’s head for the protection system to work properly. An additional cap or other object may limit this clearance. Wearers may be unaware that the cap or object contains metal parts, such as a metal button at the top of a baseball cap, which may diminish the dielectric protection provided by the hard hat. Under no circumstances should any item be placed above or below the crown straps. This will affect the performance of the hard hat. Users should note that some products, such as fabric winter liners and cotton sunshades, are designed to work in conjunction with hard hats. Is it OK if I put stickers on my hard hat or engrave it? The use of self-adhesive stickers by individual users to “personalize” their hard hats or for other marking or identification purposes is a common practice. Because of the type of adhesive used in typical pressure-sensitive stickers, there is very little potential for chemical interaction between the adhesive and the helmet shell, and their use would not be expected to negatively affect the performance of the helmet under normal conditions. Adhesive stickers should be placed at least ¾” away from the edge of the helmet, and the area of the helmet covered in this way should be kept to a practical minimum to permit regular inspection of the helmet shell for signs of damage from use or aging. If any surface cracks, however small, should appear on the shell surface, either in the vicinity of the stickers or elsewhere, the helmet should be removed from service and replaced immediately. The practice of engraving identification data on the underside of the brim of the helmet will not adversely affect the helmet’s performance; however, this engraving must be restricted to the brim only. Any engraving or modification of the helmet shell material in the crown area above the intersection between the crown and brim, or in the vicinity of the suspension key sockets, may result in failure of the helmet to provide protection in an impact and could result in injury or death. The best practice is always to use the helmet as it was received from the manufacturer, or to consult the manufacturer before making any product modifications. I work in a steel mill. Are there any hard hats specifically designed for high heat environments? To meet the demands of high heat environments, Bullard offers the 911C (cap style) and 911H (hat style) in technologically advanced thermoplastic materials. Bullard's 911C and 911H shells are molded in the same grade of thermoplastic material that we use in our rugged Wildfire® fire helmets. There is a Wildfire version, the FH911C, that is certified to the NFPA 1977-1998 Wildland firefighting standard. The only difference between the 911C, 911H, and FH911C is the addition of reflective markings, accessories, and certification specific to firefighting; the materials are the same. The only applicable ANSI/ISEA Z89.1 heat test on industrial hard hats is curing the hat/cap at 120°F (option 140°F for High Temp); however, since Bullard’s 911C & 911H are designed from the same material as the Wildfire helmets, these hats must meet the requirements of NFPA 1977-1988 standards. This standard requires that the hat be exposed to a temperature of 350°F for a period of five minutes; as well as a full battery of other tests such as shock and penetration resistance, radiant heat conditioned resistance and flame resistance. Although only the Wildfire variant of the 911C Series is certified to the NFPA standard (due to requirements for special accessories), the materials used in the 911C and 911H are the same, and their heat resistance characteristics are identical. Unfortunately, most plastic materials soften gradually over a wide range of temperatures. Therefore, there is no specific temperature at which they change from solid to liquid. As a result, there is no straightforward answer on the melting temperature of a given material. Bullard’s high heat thermoplastic caps are ideal for utilities, welding, foundries and steel mills. We replace our hard hats every five years regardless of condition. Is there any way to tell how old a hard hat is? Year the hat or cap was molded. The large arrow inside the “Month / Year” circle points to the month, and the two digits inside that inner circle indicate the year. The arrow inside of the “Day” circle points to day of month. 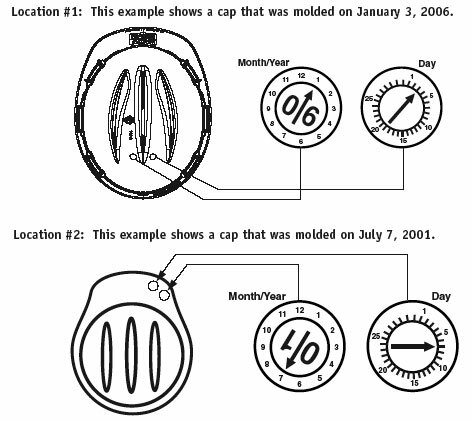 Depending on what model hard hat / cap you have you may find the date code in one of two locations on the hat, on the inside of the shell or the underside front brim of the hat / cap. Do your hard hats carry any kind of warranty? Bullard hard hats and caps have a two year warranty from date of manufacture. As long as the product is stored properly, according to manufacturer’s recommendations, the actual “useful life” of the hard hat does not begin until the helmet is placed in service. For more detailed information on warranties and replacement guidelines, refer to the Bullard Industrial Head Protection User Information Guide. For additional information, contact Bullard Customer Service at 877-BULLARD (285-5273). Can I recycle my hard hat? Most Bullard Hard Hats are made from high-density polyethylene (HDPE), which is a Type 2 plastic for recycling (see marking on the inside of the hat). That means our hard hats are recyclable like many other Type 2 plastics such as milk containers, laundry detergent bottles and Tupperware. Type 2 plastics are widely accepted at recycling facilities, and we suggest contacting your preferred recycling facility for further details. Bullard's High-Heat Hard Hats are made of polycarbonate, which is a Type 7 plastic, which is harder to recycle. Please contact your preferred recycling facility to find out if they can accommodate Type 7 plastic recycling. I’m wearing a Bullard faceshield. Do I need any additional eye protection, or does the faceshield protect against everything? When properly installed, Bullard faceshields provide only limited protection from flying particles and splash or spray of hazardous liquids. Certain models, so designated, also provide antiglare protection. DO NOT use any faceshield unless you also wear suitable primary eye protection devices designed for your work application. If you are not certain which eye protection device to use, ask your employer. Care shall be taken to recognize the possibility of multiple and simultaneous exposure to a variety of hazards. Adequate protection against the highest level of each of the hazards must be provided. Operations involving heat may also involve optical radiation. Protection from both hazards shall be provided. Caution should be exercised in the use of metal frame protective devices in electrical hazard areas. Bullard faceshields are not intended to provide protection in environments that expose the user to open flames or high-energy arcs. Bullard visors ARE NOT shatterproof. Large objects and/or objects traveling at high speed which strike these faceshields may break or penetrate the visor and cause injury to the wearer's face or eyes. The visor will not protect the eyes from harmful rays. Avoid areas where the danger of high speed flying particles exists. Be certain that any equipment that creates a potential hazard from flying particles, chemical splash, or molten metal is equipped with appropriate machine guards and safety devices. Inspect the product frequently and replace worn or damaged parts immediately. Bullard visors conform to ANSI/ISEA Z87.1 Standard for face protection when used in combination with Bullard headgear or faceshield brackets. What certifications does the SparxLift have? ADF is an acronym for Auto Darkening Filter which utilizes a shutter type LCD to decrease light penetration when energized. What if the ADF fails to darken? You will still have continuous Shade 4 protection from UV and infrared radiation due to a full-time band pass filter. Is an ADF better than a passive lens? While the choice for ADF is largely a matter of expense and preference there are solid financial and safety reasons to select an ADF. First, productivity is increased because the welder does not have to take the time to lift his/her helmet between arc strikes. Next, neck strain injuries are avoided since the welder doesn't have to "nod" to lower the welding lens. Furthermore, accuracy is improved because the welder can always see what he's doing and start in exactly the right spot. What does the shade setting control? This controls how much the ADF will darken when energized. What does the delay setting control? This elongates the time it takes for the filter to return to the light state. This is particularly useful with Pulse MIG or Pulse TIG welders and helps reduce flickering and "tired" eye phenomenon. What does the Radio Frequency (RF) setting control? This is useful for TIG welding processes. Switch to High for extremely low amp TIG (down to 1 amp) or when using shielded cables and welders. Switch to Low when working near other welders or in areas of high RF interference to avoid false triggers and for general welding. What shade settings should be used for what applications? What respiratory filters are appropriate for welding hazards? Metal fumes produced by welding include (but are not limited to) copper, magnesium, zinc, lead, chromium, nickel, and manganese. These can be effectively captured by a high efficiency particulate filter. Concentrations can be reduced with ventilation. If gases and vapors are a concern, then a gas or vapor filter cartridge or supplied air respirator may be necessary. Consult with your employer's Industrial Hygienist or Safety Manager. Where can I find the technical specifications for the EVA SparxLift? Where can I find the technical specifications for the SparxLift Supplied Air Respirator? Can I mix and match components from different respirator manufacturers? No. NIOSH only approves complete systems, not components, so they cannot be mixed and matched. NIOSH respirator users notice November 6, 1984. How can I determine the appropriate respirator for a given respiratory hazard? Do all respirators require fit testing? Does Bullard sell any respirators that do not require fit testing? Yes, the CC20 Series, the RT Series, the GR50 Series, the 20LF Series, the 88VX Series, the GenVX Series, and the SparxLift Series are all loose fitting and therefore do not require employers to perform fit testing. Does Bullard sell any respirators that require fit testing? Yes, the FAMB Series and Spectrum Series®. How often must I perform fit testing? Is a medical evaluation required if a loose fitting respirator is used? Yes. The respiratory protection standard requires any workplace where respirators are required the implementation of a written respiratory protection program which, among other things, includes a provision for the medical evaluation of employees required to wear respirators. What components are necessary for a Point of Attachment (POA)? Why do Supplied Air Respirators use specific pressure tables? In order to achieve the appropriate flow of air into the respirator (in CFM), the pressure of air from the air source (in PSI) must be regulated according to the respirator system and components being used. Type of respirator, length of hose, and flow control (or cooling device) all affect final flow of air to the user. All NIOSH approved respirators are required to deliver between 6-15 cfm (for loose fitting hoods and helmets) and 4-15 cfm (for tight fitting masks and facepieces). Manufacturers create the pressure tables to deliver the required flow. Flow is hard to measure in the field – respirators don’t have built in flow meters. Voltage is easy to measure since it is done in parallel with a voltmeter. Remember: “You set a pressure to achieve a flow”. What is the difference between a seal check and a fit test? A fit test is a formal test used to select the right size respirator for the user, conducted at intervals (LINK “INTERVALS” TO FIT TESTING QUESTION). A seal check is a method to verify that the user has correctly put on the respirator and adjusted it to fit properly. This needs to be conducted every time a respirator is donned. Does NIOSH approve Type CE PAPRs that can be used for abrasive blasting? No. Type CE only applies to supplied air categorized respirators. PAPRs fall under the category of NIOSH Part 84 Subpart L, 84.190 – Chemical Cartridge Respirators. What type of pipe can be used to hard-pipe air to or from a Bullard Clean Air Box air filtration system or Bullard Free-Air® pump? Are the gases in the CABCK, CABCK17L and CABCK103L NIST (National Institute of Standards Technology) certified? Yes. Certification documents can be obtained by contacting Bullard Customer Service at info@bullard.com. When the request is made, please include the lot numbers from the bottle labels. Is the EVA PAPR with a HEPA filter appropriate for use around asbestos fibers? The employer must implement a respiratory protection program in accordance with 29 CFR 134 (b) through (d) (except (d)(1)(iii)), and (f) through (m), which covers each employee required by this section to use a respirator. Employers must provide an employee with a tight-fitting, powered air-purifying respirator (PAPR) instead of a negative pressure respirator selected according to paragraph (g)(3) of this standard when the employee chooses to use a PAPR and it provides adequate protection to the employee. As you can see, PAPRs, such as the EVA, are quite appropriate but it is important to note that the PAPR must have a tight-fitting mask. You can also see that HEPA filters are required with the PAPR. This makes sense because asbestos fibers are particles and HEPA filters are designed to capture particles and prevent exposure. Is the EDP16HAZ explosion proof? The customer will need to verify that the intended environment, according to the National Electric Code (NEC) Articles 501-503, falls into one of these categories. A copy of this guide can be found at the bullard.com Respiratory Resource page. Can the ADP20 be used in hazardous locations, since it is an air-driven pump? The end user ultimately makes this determination, based upon their safety policy. The USA does not have hazardous location certification for non-electrical items (i.e., an air-driven pump). Europe has standard EN13463-1 for non-electrical equipment for explosive atmospheres. The air motor in the ADP20 (not the entire pump assembly) conforms to EN13463-1 for Group II Cat 2 (gas and dust) protected by construction (surface temp rated 135C). What are the suggested air temperature ranges for the Bullard ADP20 Free-Air® pump? The motor manufacturer suggests an ambient air temperature range of 34°F - 104°F. How long can a Bullard COHP run on just a 9V battery? What calibration gas do I use to calibrate my Bullard Clean Air Box (CAB)? Bullard CABs require 2 gases for calibration: Zero Air and 10ppm CO. Bullard offers a calibration kit with everything you need to keep your CAB calibrated. Just ask your local Bullard distributor. What kind of extension cord can I use and how long can it be for use with an EDP30? You may use up to 50 feet of 30 amp, 3-wire grounded extension cord to reach your electrical outlet. We recommend using 8-gauge wire. Avoid excessive lengths of extension cord, especially if you are running the pump continuously. Where can I learn more about Cooling Devices and Free-Air Pumps (air flow vs. pressure)? In this convenient PDF chart. What are the sound levels (dBA) of the Bullard Free-Air Pumps? Where can I get information on the Ebola virus? Bullard has provided a web page that contains an overview of Ebola, the recommended guidelines by the U.S. Centers for Disease Control (CDC), and the products offered by Bullard to help prevent the spread of EVD. How cool will the Isotherm Vest get? The Isotherm Vest will remain at a constant 55° F, reducing the chance of heat-related illnesses that sometimes occur in today’s difficult work environments. How long will the Isotherm Vest cool until I have to recharge it? The Isotherm provides cooling for approximately 2 1/2 hours, depending solely on work activity and environmental conditions. How do I recharge my cool pack? Cool packs may be re-energized thousands of times providing hours of safe, controlled body temperature management. Placed in a cooler of water, the cool packs will fully recharge in approximately 20 minutes. However, ice water is not necessary as the phase change technology actually begins recharging the packs whenever they are placed in an environment that is cooler than 55°F. How much cooler or warmer does incoming air become when using an air cooling system? Bullard Cool Tubes cool incoming air from compressed breathing air sources by as much as 20 -30°F (11 -17°C.). Bullard Hot/Cold Tubes and Dual-Cool Tubes can cool or warm incoming air from compressed breathing sources by as much as 30°F. Is the Isotherm fire retardant? Yes, the Isotherm and Isotherm Class 2 series is made of fire retardant cotton material. The yellow Isotherm (ISO2HY, ISO2HYXL) is not made of fire retardant cotton. Do you have a high-visibility vest option? Yes, the Isotherm Class 2 High-Visibility vest meets ANSI/ISEA 107-2010 Class 2 high-visibility requirements. Are the cooling packs inside the vest safe? Yes, the Isotherm packs are non-hazardous, non-flammable and non-combustible. Do not expose the packs to temperatures above 275° F. If the packs leak, rupture or become opened, discontinue use immediately. How can I keep my vest in the best condition? The Isotherm vest is durable and easy to maintain. Store your vest flat in a cool, dry environment away from unnecessary ultra-violet light exposure. Clean the cool vest fabric carrier by hand washing in mild soap and water and lay flat or hang to dry. If you are using the Isotherm Class 2, be sure to replace the cool vest fabric carrier (ISOC2V) after 25 washings. What are Bullard Fire & Rescue helmets made of and how are they manufactured? Bullard offers both composite and thermoplastic fire helmets. Each material has its own specific strengths. What materials make the “best” fire helmet? Unfortunately, there is no simple answer to that question. The high heat resistance of modern thermoplastic materials has effectively eliminated what had previously been the primary advantage of thermoset composites, namely their inability to melt. The temperatures required to melt Ultem® and Lexan® are so high as to cause chemical degradation of most thermoset resins. At the same time, these new materials exhibit the high quality surface finish, scratch resilience, and impact resistance that has long been associated with thermoplastics. Composite materials still offer benefits, however: their cross-linked molecular structure, in addition to preventing melting, also gives these materials an exceptional resistance to chemical attack while their traditional inferiority in impact resistance is being increasingly offset by new developments in high strength resins and reinforcements. Many commonly held beliefs are the result of experience with products in the field. While certainly valid, these experiences in many cases have occurred decades ago and may not accurately represent the nature of modern materials and products. How Resilient are your fire helmets in typical heat exposures due to firefighting? Typical heat exposures due to firefighting fall well within the range of performance for composite and thermoplastic helmets. Concerns should be raised when helmets are exposed to high heat such as flashover chambers, training fires, and direct flame impingement. Repeated heat exposure under the 250°F range will have limited effect on helmet shells. The difference begins to take place above this range. Thermoplastics can deal with repeated exposures well above 400°F with little damage, whereas repeated exposures will cause composites to break down over time. Heat exposures as they have been described will have less of an impact on thermoplastic helmets. Both composite and thermoplastic helmets will perform well when new. The degradation is a time/heat combination that has greater impact on composites. Thermoplastic helmets can exhibit blisters or bubbling due to heat exposures. The types of bubbles that you might see on these helmets can range from small ballpoint pen size blisters to large thumbnail size blisters depending on the type of heat as well as the length of time of the exposure. Thermoplastic is much like a sponge with the ability to absorb moisture via humidity. The blistering or bubbling in thermoplastic helmets is a reaction due to moisture trapped in the material that vaporizes and expands. The softened plastic stretches to accommodate this expansion of gas causing the blister/bubble to form. Radiant heat is the line-of-sight heat found in high heat exposures such as fuel fires. This heat can develop in structural fires due to the synthetic compositions of the material found in structures today. This type of heat exposure is like a laser beam. Reports have shown where 2 firefighters have been within inches of each other and one would receive damaging heat exposure to some portion of the ensemble while the other firefighter did not experience any serious heat. Any blistering or bubbling of a thermoplastic helmet when exposed to radiant heat usually results in small pen size blisters in a very localized area of the helmet shell. This reaction to radiant heat can result after only seconds of exposure. Convective heat is the type of heat that envelops the room or rooms involved with a fire. This is much like walking into an oven. Heat is everywhere. Since this heat stratifies, the time it takes to boil moisture inside a thermoplastic helmet shell becomes shorter the greater the distance from the floor. Unlike radiant heat, convective heat that causes blistering or bubbling often requires several minutes of exposure. Are Bullard fire helmets resistant to chemicals? Hydrocarbons are the unburned portion of fuels in a fire that can be carried by the heat and gases up in the air and deposited on firefighting equipment. The soot often found on helmets after a fire will contain some of these hydrocarbons. This unburned material is the primary source that can attack some of the older thermoplastics used prior to 1992. Although there is a remote chance that some fuel fires could deposit enough hydrocarbons on a recent thermoplastic helmet to create damage, it is unlikely. Manufacturers have not seen any complaints in recent years to indicate that this remains a problem. Certain chemical solvents can be harmful to fire helmet shells. In practice, this has not been a significant issue in terms of fireground chemical exposures in recent years; it more commonly is encountered in the cleaning of helmets. Thermoplastic materials tend to be more sensitive to chemical attack than composites, and care should be taken in selection of liquid cleaning agents. Only detergent and warm water should be used to clean fire helmet faceshields and shells, whether thermoplastic or composite. If there is any question about the performance of helmets in a particular chemical environment or the use of a cleaning solvent, the helmet manufacturer should be contacted. How should I clean my Bullard fire helmet? For the best cleaning results, disassemble the helmet according to the instruction manual provided with the helmet. Mild soap and lukewarm water remove most dirt and some smoke residue. Rinse the helmet with lukewarm water after using any cleaning agent. It is possible to paint an existing composite fire helmet. The original helmet manufacturer must approve the paint. Paints must be flame resistant and be non-conductive to meet specific performance requirements. Thermoplastic helmets should not be painted. Paints can and will often contain solvents that could attack the thermoplastic properties, causing premature aging and potential cracking of the shell material. The thermoplastic is pigmented with a color and will not lose that color due to exposures. Therefore, the need for painting is eliminated under most conditions. When should I replace my fire helmet? The NFPA 1851 Standard on Selection, Care, and Maintenance of Protective Ensembles for Structural Firefighting and Proximity Firefighting states that the mandatory retirement age for helmets is 10 years from the date of manufacture. However, any helmet should be removed from service if it has sustained a substantial blow from falling objects. The same would be true if the wearer has fallen and his head and helmet impacted the ground. When in doubt, take it out of service. Should a thermoplastic helmet experience blistering/bubbling due to high heat exposure, remove it from service. Remove any helmet that is exposed to direct flame. Carefully examine composite helmets exposed to high heat for potential surface cracking/crazing due to the exposure. The composite shell should remain rigid when you attempt to flex the material. Any cracking sounds and ease of flex are signs of weakened material. Helmets are sometimes kept in service well past their useful life. All elements of the firefighter’s ensemble will and do “wear out”. Frequent inspection with trained/educated eyes is needed to determine if a helmet can remain in service. These inspections should increase in frequency and their level of scrutiny as helmets get older. How does thermal imaging work? Is it the same as night vision? No. Night vision and thermal imaging are two completely different technologies. Night vision works by amplification of ambient visible light, so therefore requires some amount of visible light to function properly. Likewise, night vision equipment can be “blinded” by an exposure of too much light. Conversely, thermal imaging requires no light because the sensor (called the detector or focal plane array) is designed to detect long-wave infrared (LWIR) heat energy which resides below the frequency range of visible light in the electromagnetic spectrum. Thus thermal imaging does not depend on light to operate. In fact, because the sensor does not detect visible light, it therefore does not matter how much or how little light is available. But because everything and everyone emits surface heat, sensors which can discern these subtle differences can process them in order to make an image, where temperature differences are converted into a differences in black-and-white shading. Additional processing algorithms allow some thermal imagers to measure the temperature of a surface and to colorize certain areas of interest, such as extremely high-temperature areas. Is grant funding available for thermal imaging purchases? Yes. Your Bullard sales representative can help you learn about available grants and tips to get you started. There are a variety of grants available that include categories specific to law enforcement and fire departments, as well as line items that qualify thermal imaging for funding. What is the difference between a thermal imager which is “NFPA-certified” and one which is not? The National Fire Protection Association (NFPA) establishes codes and standards, one of which is NFPA 1801. This particular standard establishes baselines for thermal imagers in terms of image quality, durability, and standardization of operation. Some grant funding sources and/or local policies may mandate the purchase of an NFPA-certified thermal imager. Is thermal imaging evidence accepted by courts? Yes. There are many applications that have withstood the test of case law and have therefore been accepted as sound, defensible uses of thermal imaging in law enforcement. The Law Enforcement Thermographer’s Association (LETA) can provide more information. Didn’t courts rule that thermal imaging could not be used in surveillance of residences? No. In 1992, officers conducted surveillance on the house of a suspected marijuana grower (Danny Kyllo) and based upon the abnormal heat signatures coming from the house, entered and located a growing operation, after which they arrested Kyllo. Subsequent challenges and appeals all the way up to the Supreme Court of the United States resulted in that court’s ruling that the arrest had resulted in a violation of Mr Kyllo’s Fourth Amendment rights. As a result, thermal imaging can still be used for this type of surveillance, but probable cause must be established and search warrant(s) issued before surveillance. This ruling applies only to surveillance of primary residences. Where can I find training resources? Bullard has a team of fully qualified and certified professional trainers on staff in both law enforcement and the fire service who can assist you with your training needs in terms of operation and qualification. Third party agencies can also provide training and certification. For firefighters, Safe-IR (http://www.safe-ir.com/) has a well-respected training regimen. For law enforcement officers, the Law Enforcement Thermographer’s Association (LETA, http://www.leta.org/index.htm) have a well-established and court-recognized training program which certifies students as thermographers.